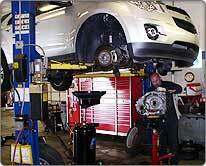 Bergey’s Parts Warehouse welcomes all mechanical repair shops to our warehouse facility. We proudly serve all repair shops in getting you through the “daily grind” of routine maintenance part necessities. Understanding your needs, Bergey’s warehouse has enough square footages space to stocks millions of dollars in original equipment so that your mechanical shop can lean on us for all of your auto part needs. We have millions of dollars invested into stocking the mechanical parts that are just right for your customers and stock higher quantities than most smaller dealerships can hold on their shelves. You may know us because we stock OEM parts for GM, Chrysler and Ford. What you may not know yet is that we understand your need for aftermarket parts in certain cases. Because of that need, we now offer Magneti Marelli parts that fit all-makes. That’s right. All-makes and aftermarket parts are available for fast moving parts; give us a call today for more information. We deliver to areas in Pennsylvania, New Jersey and northern Delaware. Check our Service Area to find more details or give us a call to ask our parts specialists if we’re in your area. Our parts warehouse caters to you-- give us a call to begin getting the auto parts you need!